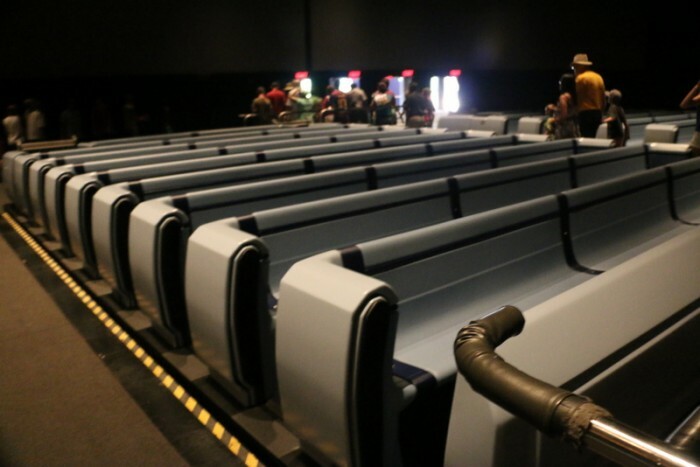 We recently brought you guides to the ride and attraction seating situation at the Magic Kingdom and at Disney’s Hollywood Studios. 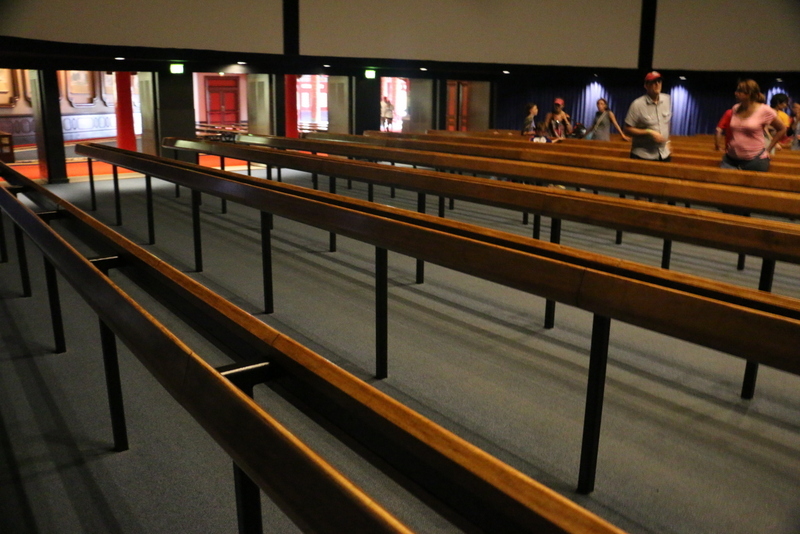 Next up is our guide to the attraction seating at Epcot. 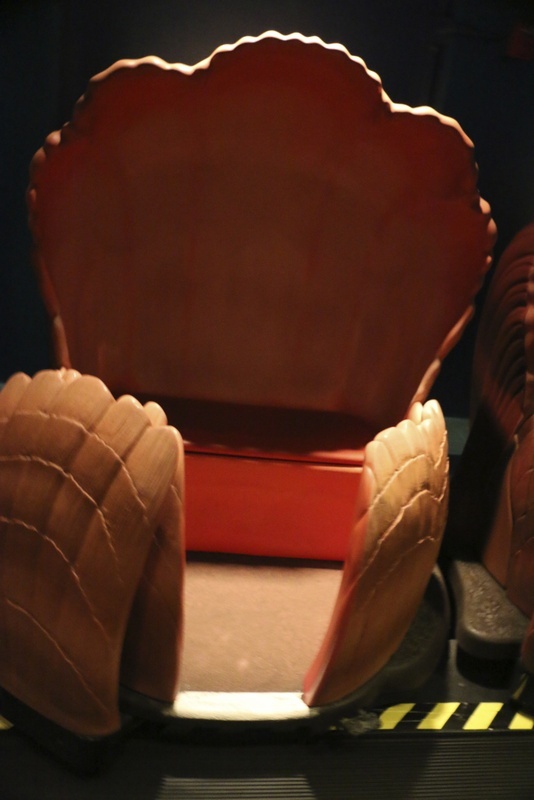 Seating surface: Lightly padded chair with armrest. 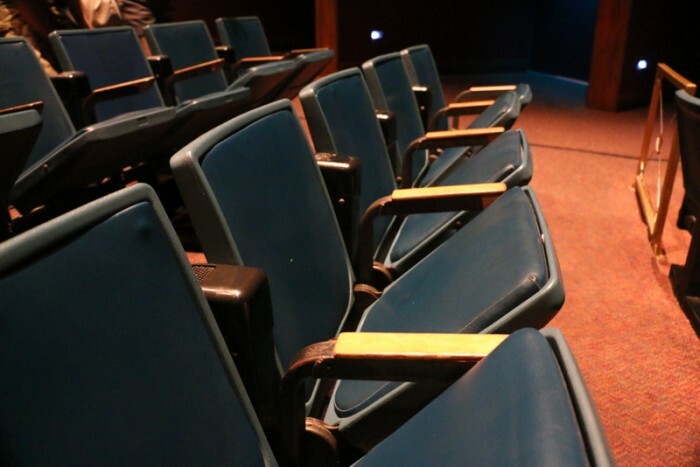 Notes: Wheelchair and ECV users may ride directly into the theater. 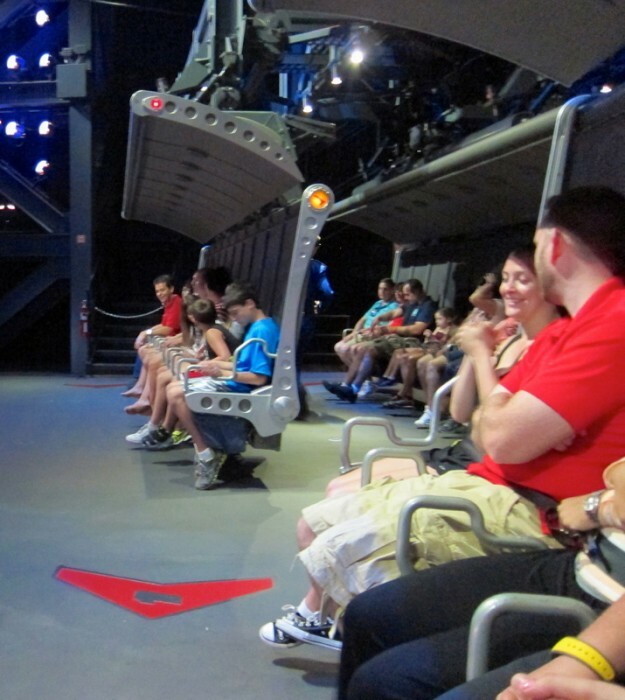 Some of the special effects can only be experienced when seated in the attraction chairs. Guests wanting the full attraction experience may want to transfer to the standard seating if possible. Seating surface: Padded chair with armrests. Seating capacity per vehicle: Approximately 100. Up to six vehicles per show. 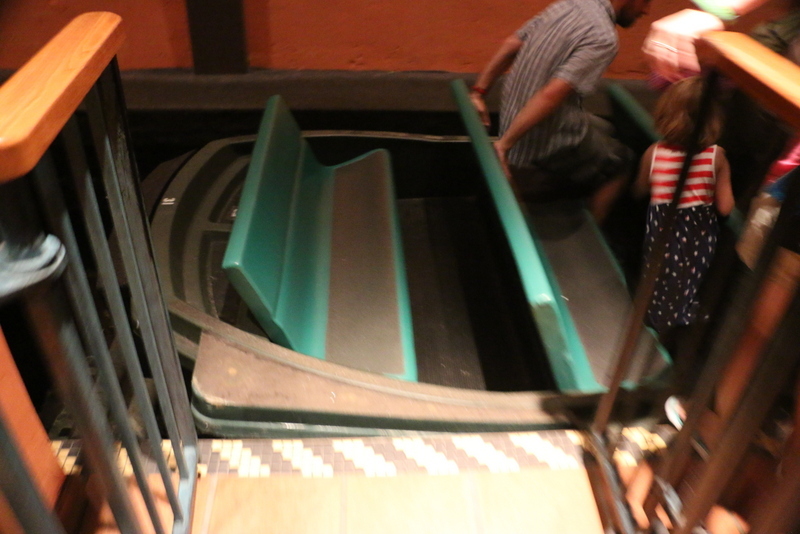 Boarding procedure: Small step (less than 12″) up into ride vehicle. Note 1: There is a wheelchair capable vehicle. Wheelchair users may ride onto vehicle. ECV users must transfer to a standard wheelchair. Note 2: This is a long attraction – about 45 minutes total. 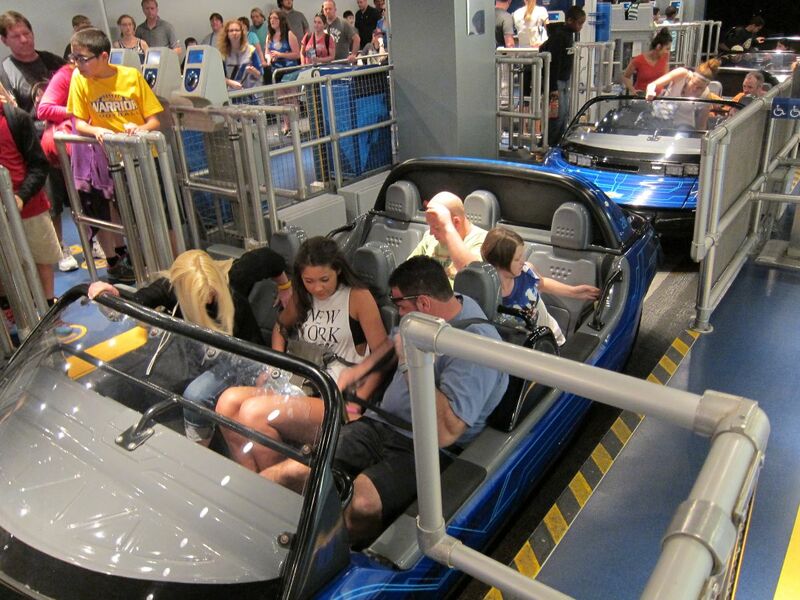 For about 35 minutes, there is no opportunity to leave the ride vehicle or to access a restroom. Seating capacity per row: 3-4. Typical capacity is three guests in the front row, four guests in the back row. This may vary slightly depending on the number of small children or the size of the adults. Notes: There is a wheelchair capable vehicle. Wheelchair and ECV users may remain seated and ride into the vehicle. 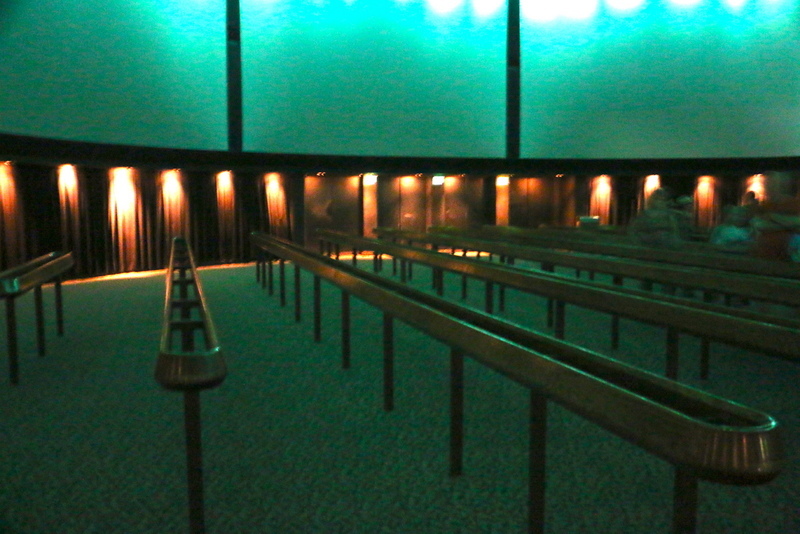 Seating capacity per row: 3-5, depending on size. Four average-size adults is a typical load per row. Seating capacity per vehicle: Approximately 20 guests per boat. Boarding procedure: Moderate step down (about 12″) into boat. Notes: There is a wheelchair capable boat. ECV users must transfer to a standard wheelchair. Seating capacity per vehicle: 4 guests per vehicle. 10 vehicles per spinner. 4 spinners total. Seating surface: Lightly padded chair with armrests. Saftey restraints: Over the head padded shoulder restraints. Boarding procedure: Small step up (less than 12″) into ride vehicle. Note 1: There are two version of this attraction, green and orange. 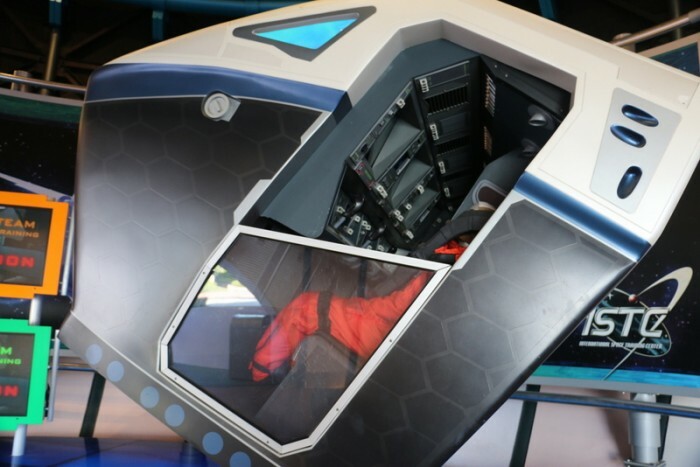 The orange version is more intense, with rapid centrifugal force added to the standard motion simulator of the green version. Motion sickness bags are standard equipment with both versions. Use of motion sickness bags is not uncommon in the orange version. Note 2: The ride vehicle closes around guests somewhat like a clamshell. This poses claustrophia issues for some guests. Note 3: Wheelchair and ECV users must transfer to the ride vehicle on their own. Cast members can provide a special transfer assistance device. 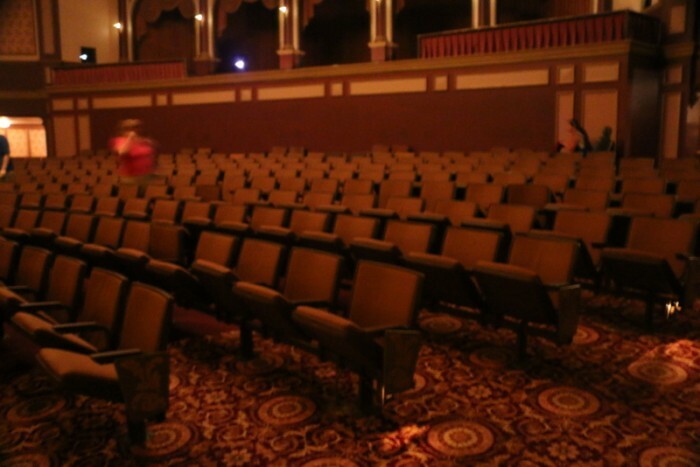 Seating capacity per row: 2-3, depending on size. Seating capacity per vehicle: One row per vehicle, 2-3 people depending on size. Standard capacity is two guests per vehicle. 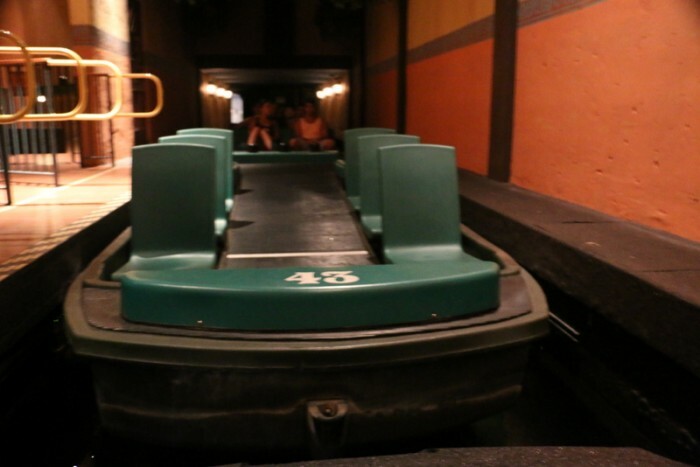 Cast members will usually allow two adults plus a small child, or one adult plus two small children, to ride in one vehicle. Larger adults may wish to ride alone. Boarding procedure: Small step up (less than 12″) from a moving walking to a moving vehicle. 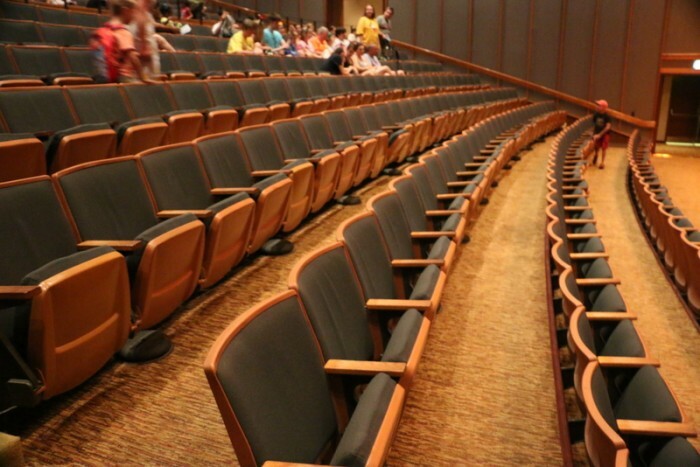 Seating capacity per row: Varies, approximately 10. Seating capacity per vehicle: Approximately 90 guests per flight. Seating surface: Flexible fabric seat with back and armrests. Safety restraints: Fabric lap belt for each individual guest. Boarding procedure: Walk into theater, sit on attraction vehicle. Notes: Wheelchair and ECV users must transfer to the ride vehicle on their own. Guests with a fear of heights may experience difficulty. 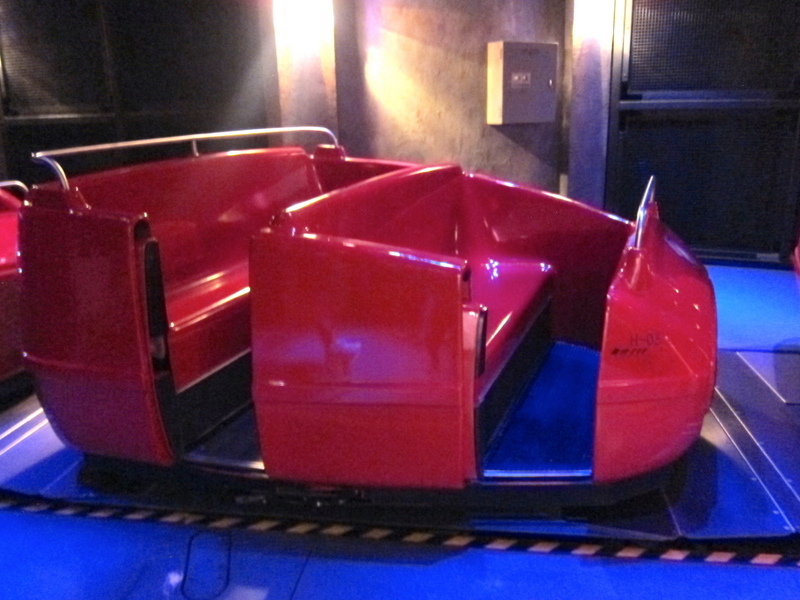 Guests with severe motion sickness issues may experience difficulty. 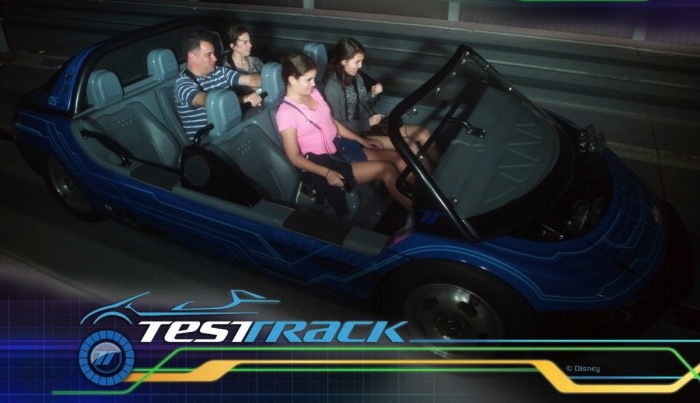 Motion sickness is not an issue for most guests. 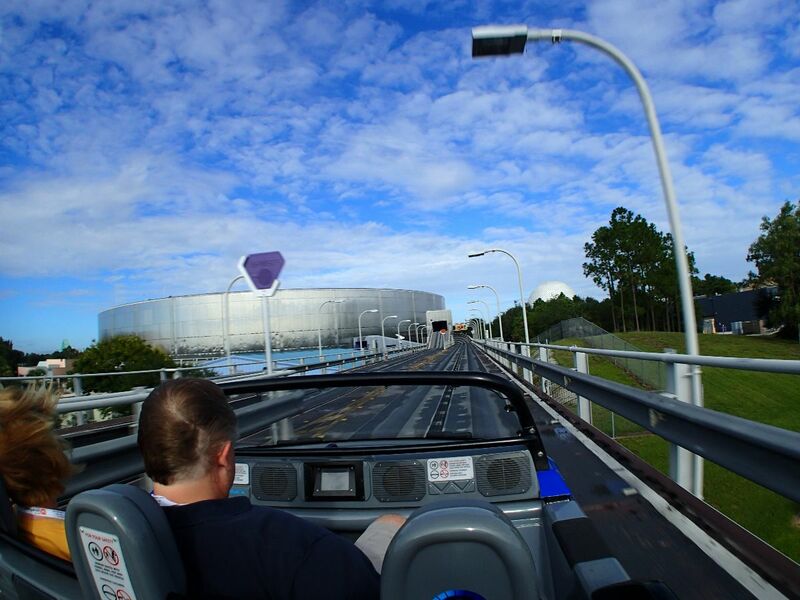 Note 1: Wheelchair and ECV users must transfer to the ride vehicle on their own. 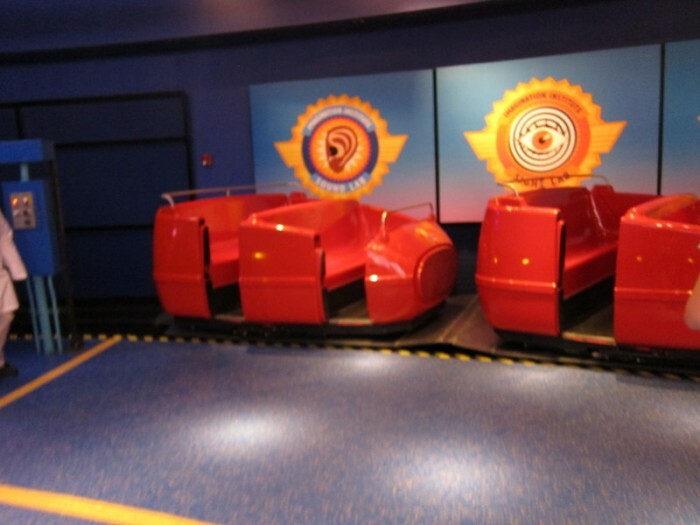 Note 2: The vehicle slowly rotates and moves backwards during the second half of the ride. A very small number of guests with motion sensitivity find this problematic. Note 3: During the second half of the ride there is an interactive element. 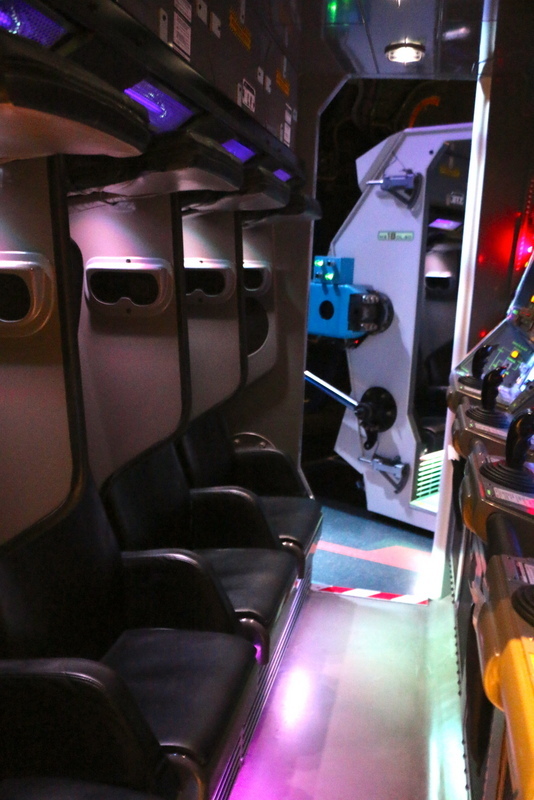 There is one ride controller per row (two per vehicle). 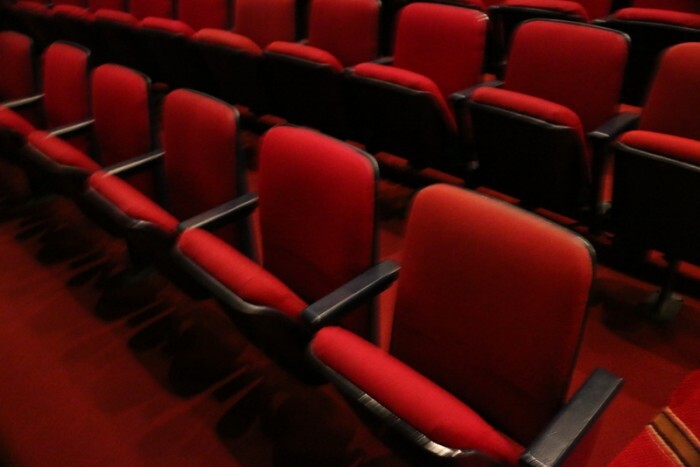 If you have children with competition or control issues, you may want to seat them in separate rows so each can control their own interactive experience. Seating surface: Hard bucket. Divider between guest’s legs. 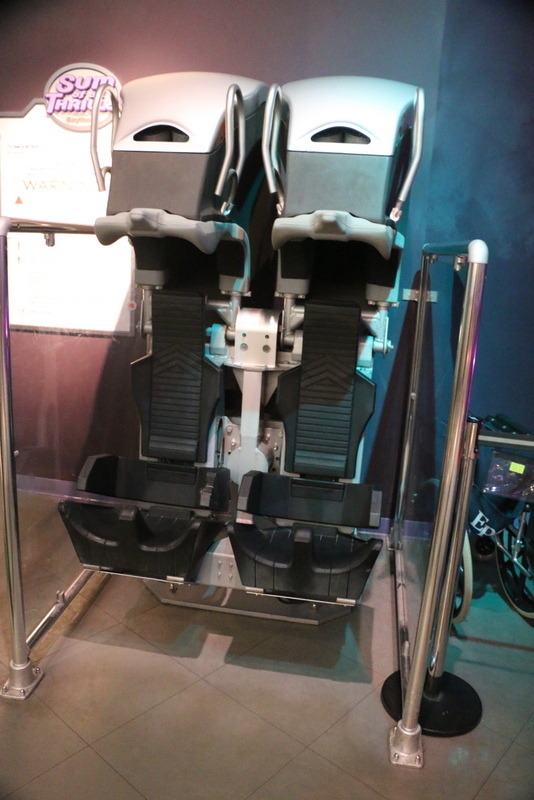 Safety restraints: Ride vehicle encloses guests. Boarding procedure: Walk up about one flight of stairs. Sit down on ride vehicle. 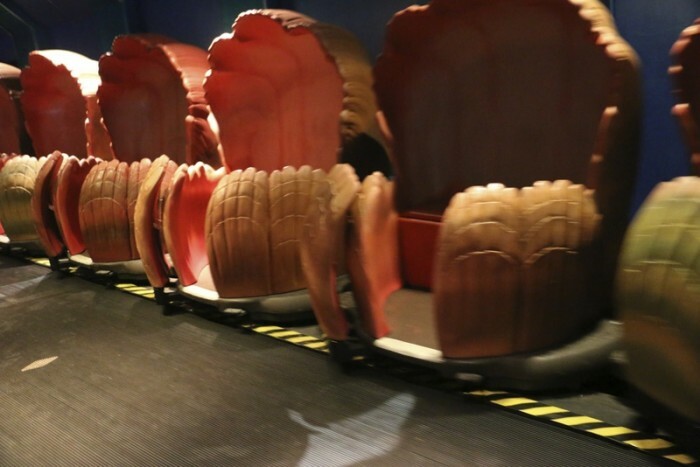 Height requirement: Guests must be 48″ to ride. Guests must be 54″ to design a ride with inversion elements. 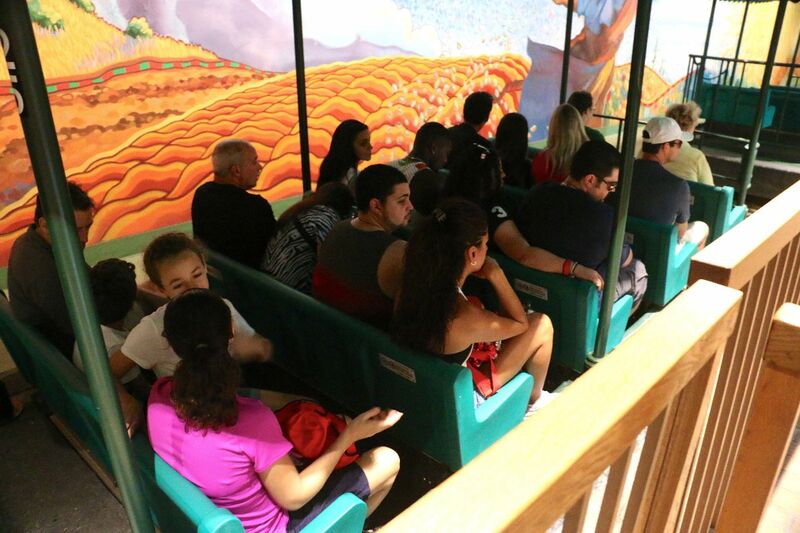 Note 1: The ride vehicle fully surrounds guests. May be problematic for guests with claustrophobia issues. Note 2: Wheelchair and ECV users must transfer to the ride vehicle on their own. Note 3: This is an interactive experience. Guests watch a brief training video and then design their own simulated roller coaster ride. You have a great deal of control over how intense you want the experience to be. Motion issues range from mild to extremely intense based on your design. 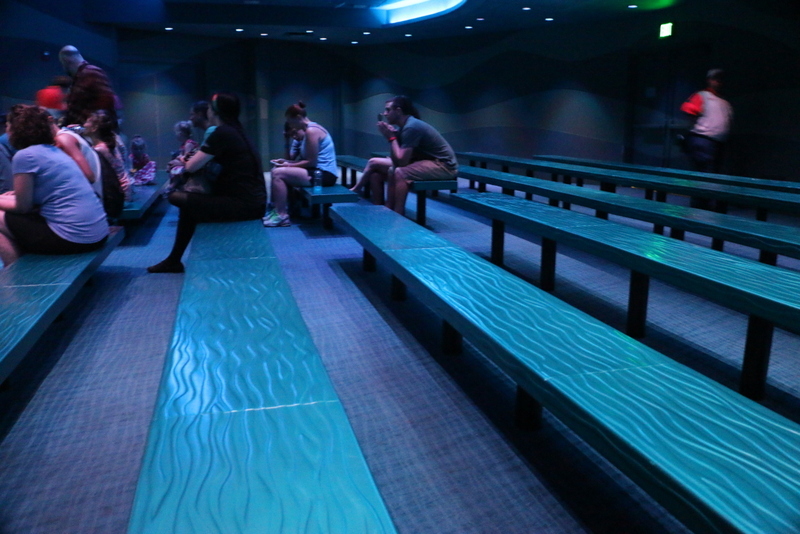 If having a mild experience is important to you, ask for cast member feedback on your design before boarding. 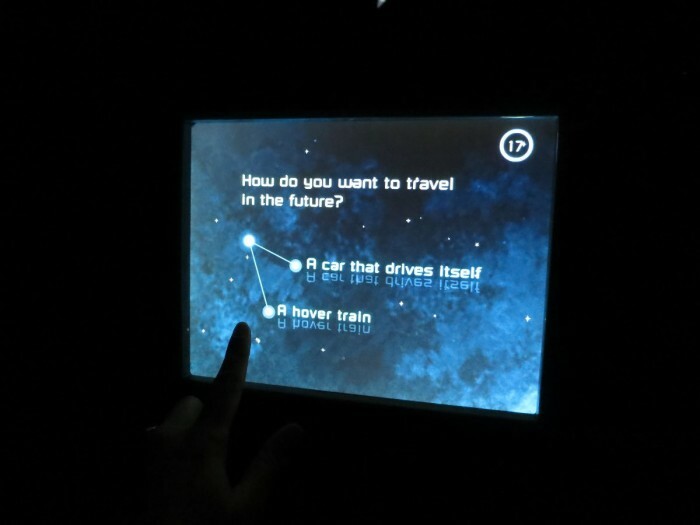 Note 4: Both guests in the vehicle experience the same simulation. You must cooperate with your companion when designing your simulation. This may be an issue for families with children with competition or control issues. Note 5: Larger guests may find the seating uncomfortably tight or impossible. Seating surface: Hard bucket seat with back. Saftey restraints: Center seat in each row has a fabric lap belt. The outer seats have fabric lap/shoulder belts. Boarding procedure: Small step up (less than 12″) over a wall, then moderate step down (about 12″) into the vehicle. 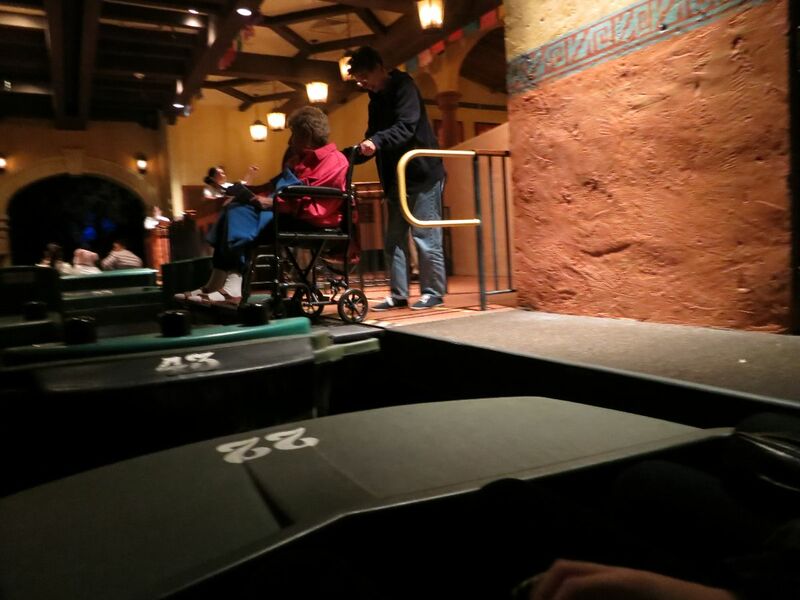 Notes: Wheelchair and ECV users must transfer to the standard ride vehicle on their own. 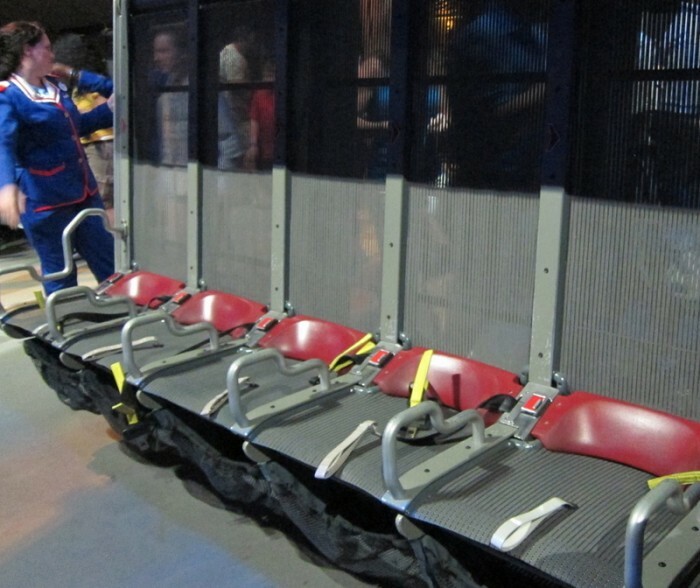 There is a transfer practice vehicle available to assess guest fit and ability to board. 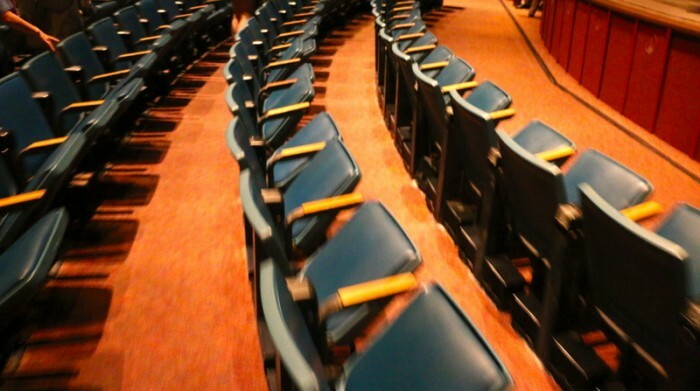 Seating capacity per row: Varies. Approximately 6-12 per row. Seating capacity per vehicle: NA. 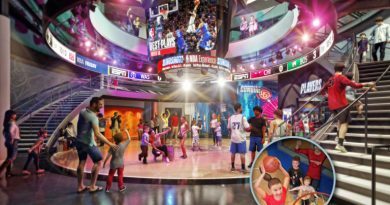 Show-style attraction. About 100 guests per show. Seating surface: Hard bench with no back. 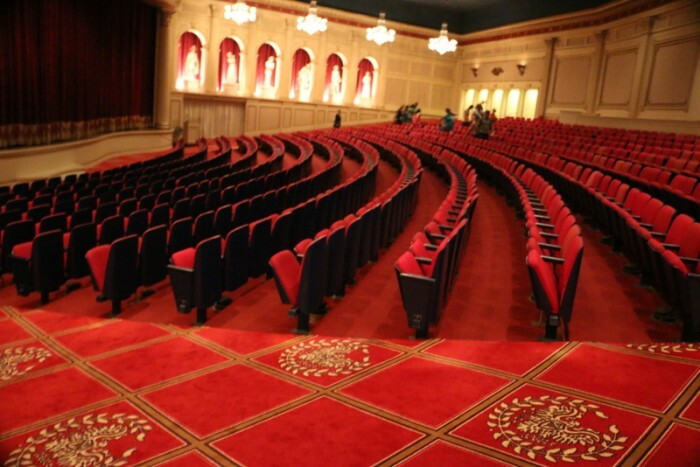 Children are invited to sit on the carpeted floor at the front of the room. 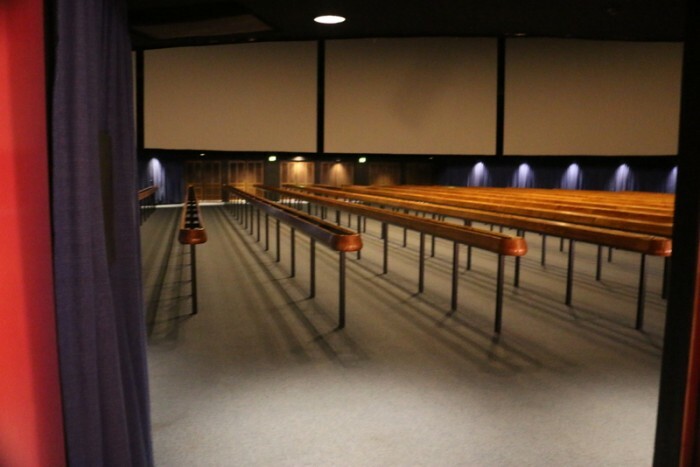 Note 1: Wheelchair and ECV users may ride directly into the theater. Note 2: The bench height varies. The first few rows are close to the ground. 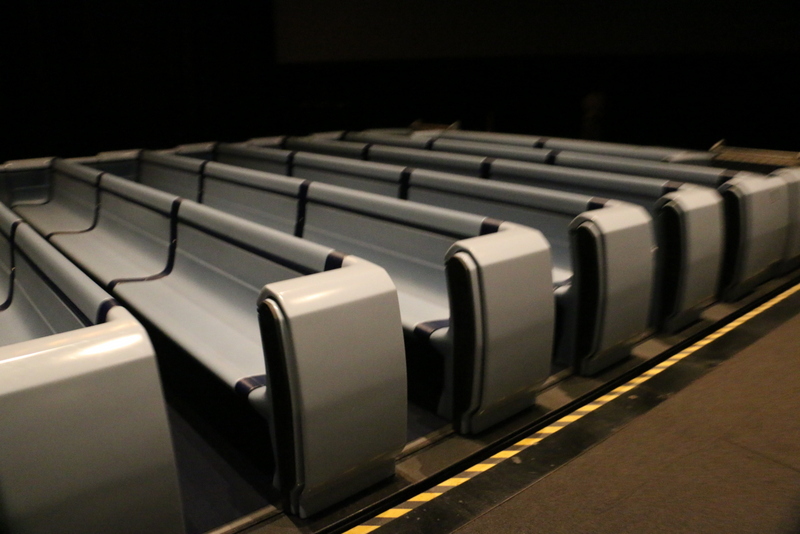 Rows further back are closer to standard seat height. Adult guests in the first few rows may be somewhat hunched over when seated. Guests with back or knee issues may prefer the rows at the rear which may be easier to stand up from. 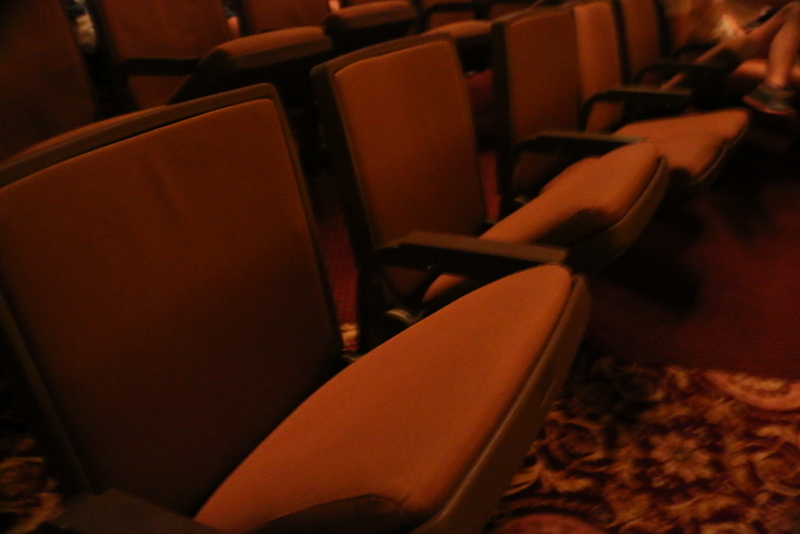 Seating surface: Padded chair with back and armrests. Boarding procedure: Moderate step (about 12″) down to enter the boat. Notes: There is a wheelchair capable vehicle. ECV users must transfer to a standard wheelchair. Seating capacity per row: More than a dozen. Seating surface: Lightly padded chair with back and armrests. Seating surface: None. 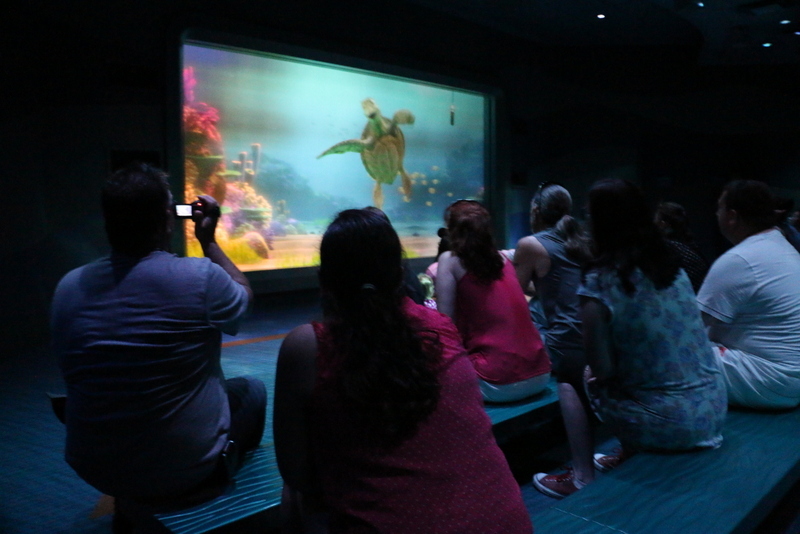 Guests remain standing throughout the duration of the attraction. There are railings to lean upon, but guests may not sit on the rails. 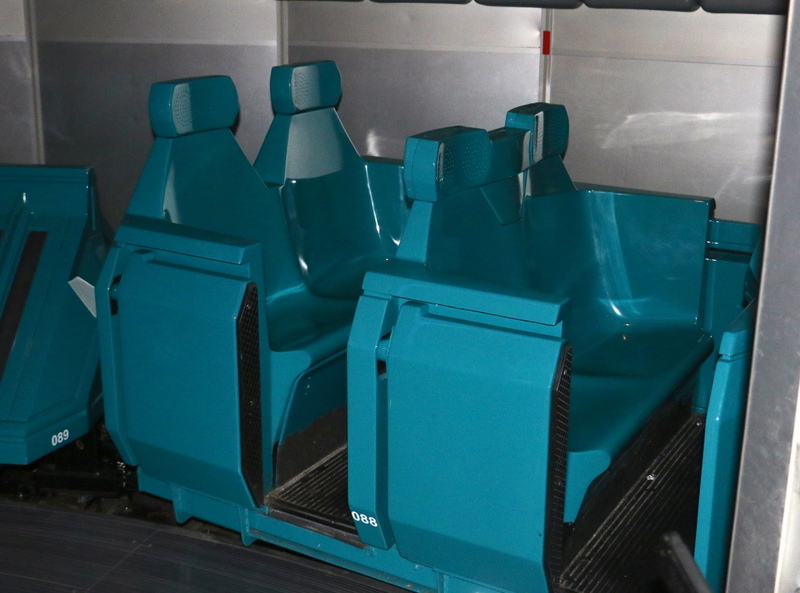 Be sure to check out our related articles about Attraction Vehicles in the Magic Kingdom, Attraction Vehicles at Disney’s Hollywood Studios, Disney Transportation Vehicles, and Touring with Odd Numbers of Family Members. And stay tuned for an upcoming post about the attraction vehicles at Disney’s Animal Kingdom. Very good reviews of the seating at WDW, Erin. Thank you very much. Seeing all the ECV/wheelchair requirements make me wonder which is best at WDW? My grandmother cannot walk long distances and is thinking about coming with us on our next trip. Are ECV too cumbersome, or are they a bit of protection when it gets crowded? Wheelchairs seem much more flexible to me, but it might be nice for her to be able to wheel around on her own if we want to go on a thrill ride. Any thoughts? Without knowing your grandmother’s full health situation and the ability of other family members to assist her, it’s almost impossible to make a real recommendation. You are correct that there are a number of attractions for which guests with ECVs will need to transfer to a wheelchair (which they have available for temporary use at the attraction) or to the ride itself. If your grandma is capable of walking several feet and taking a few steps up or down into a vehicle, then you’ll probably be OK with the ECV. Also, if you’re planning to leave her on her own several times a day, then she will likely be more comfortable getting around with an ECV. I fully admit that I am no expert in this area, I’d love for readers to weigh in on what their experiences have been. We were there last week and ran into some EVC issues. My mom hss a great condition and degenerative joints and usually travels in an electric wheelchair (360 turn capability, joystick) but had lent it out to a friend recovering from a stroke. We brought her scooter and were surprised to find some changes in place regarding ECVs. Rides she used to be able to go through the line in were now wheelchair only. 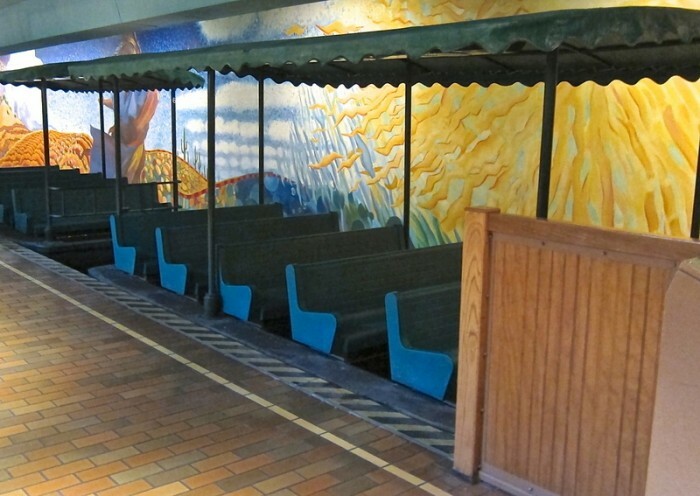 Most places had wheelchairs right there and available. One site she was told to park 60feet away and to walk over for a wheelchair. Other places we waited for over 20 minutes until a wheelchair was available for her to ride through the line. I talked to gust services about this and they were able to give me a park map with symbols in it specifically for those with disabilities that was helpful. They mentioned that her motorized wheelchair would actually be able to go anywhere a manual wheelchair would go. 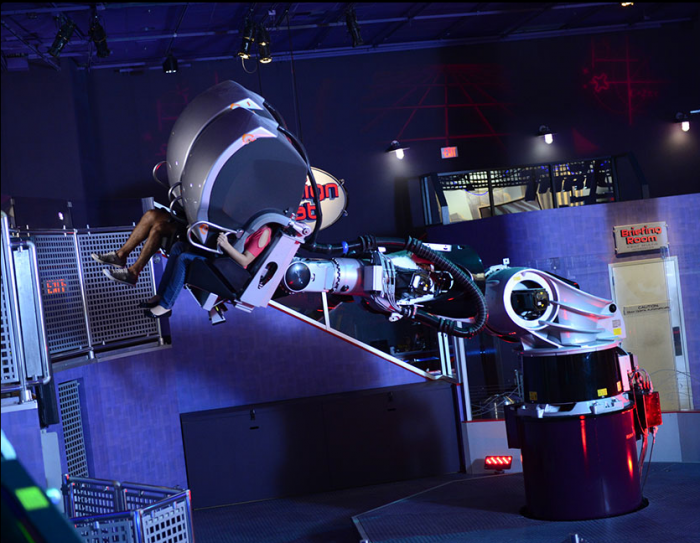 Bottom line is, ask the cast member at the front of the attraction how to best best go about riding the ride and bring a motorized wheelchair if you have one. I’m following with interest since I’m going in January on my own with a four and a five year old and want to know which rides will cause problems with seating. I’m surprised that Spaceship Earth looks like it may be a no-go. I don’t think either of my kids will want to be in a row alone without being able to see me. Is there any chance that they’d let two small kids share one row with a parent? Yes… they most likely will. We have 6 kids under 8, and have frequently had to have 1 adult and 2 children on Spaceship Earth (and many other Disney rides that typically would only be 2 per seat). Excellent information, wish we had it before our last trip but will certainly reference it before our next. Another bit of data that would be very helpful is the seat heights. As my mom’s joints further deteriorate, It is getting harder for her to ride things such as it’s a small world when it comes time to getting up out if the low seats. 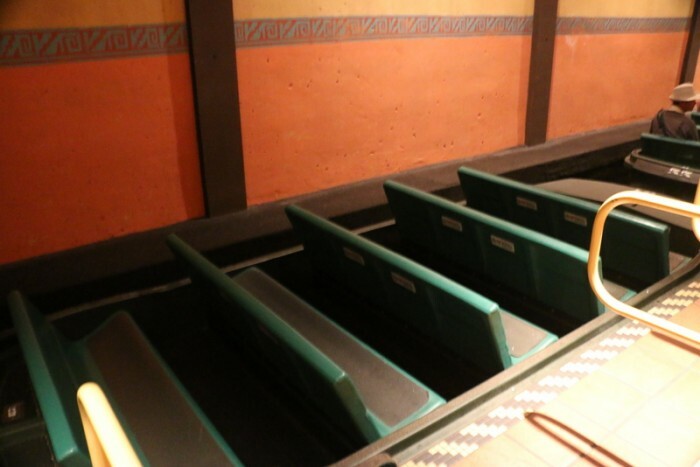 Knowing the height of the seat would help her abd others requiring handicap height seats make the decision to ride in seat, ride in wheelchair if available as an option, or skip an attraction. It may be worth noting that there is a weight limit on Sum of All Thrills. When we asked they said the weight limit is 250lbs. I have ridden “Sum of All Thrills” several times, and I an 6 foot 8 inches tall, and weigh 330 lbs. I have a size 44 waist. It was a little snug, but the ride went fine. Hope this helps!